A former governor and federal cabinet member had many requests for ways to spend her time, energy and reputation. ... ASG wrote a strategic plan for managing the Governor's post-office reputation and legacy. The plan included strategy on her involvement in both state and national matters and recommendations for how she should expend her time in the public eye. As part of a full-service effort, ASG assisted with drafting speeches and op-eds in the Governor's name that furthered the direction we suggested her legacy take. Whitman was the first woman elected as Governor of New Jersey. "The D.E.P. never recovered," Mr. Wolfe said. "In her first three years in office, 738 employees at the state Department of Environmental Protection (DEP) lost their jobs, and the remaining staff found themselves on a four-day week," wrote Laura Flanders in her book "Bushwomen" (Verso, 2004, full title, "Bushwomen: Tales of a Cynical Species"). Under Whitman, DEP also eliminated the Office of Public Advocate. Whitman did create a few environmental positions as governor -- an Office of Dispute Resolution within DEP, that "usually resolved [conflicts] business's way"; and an Office of Business Ombudsman, "created to help businesses navigate environmental laws," wrote Laura Flanders. "A famous survey of state workers found that Whitman's environmental staff thought the biggest problem facing New Jersey's Department of Environmental Protection was the Governor herself," Flanders added. In 1997, a survey was conducted of NJDEP employees to guage their views on Whitman's environmental policies. "According to the professional staff who worked under Governor Whitman in New Jersey, pressure to block enforcement of anti-pollution laws, back-door efforts to gut regulations and a pervasive fear of retaliation have been the hallmarks of her tenure," stated PEER Executive Director Jeff Ruch. "Cozy accommodation of corporate violators appears to be her regulatory style." Nearly two out of three employees report instances where "DEP inaction or lack of enforcement has caused environmental damage." More than three out of four employees say that the "level of DEP's environmental enforcement has decreased in the past three years." Nearly three out of four employees believe that under Gov. Whitman, the "regulated community excessively influences DEP permitting, policy and enforcement decisions." Whitman championed "market based" environmental policies, and derisively dismissed many environmental programs as "soviet style command and control regulation" and EPA "mandates from Washington". The approval of "open market" air pollution trading authority for states, the first initiative from Christine Todd Whitman at U.S. Environmental Protection Agency (EPA), violates the Clean Air Act to the detriment of public health, according to complaints filed by Public Employees for Environmental Responsibility (PEER) and the New Jersey Chapter of the Sierra Club. Last week, EPA formally proposed open market trading for Michigan and New Hampshire. Approval of similar programs is pending for New Jersey and Illinois. Under open market trading plans, corporations can buy credits instead of cleaning up pollution. These credits can be generated from, and exchanged between, different pollution sources (e.g., smokestacks for auto emissions) and over different periods of time (allowing industries to create credits today for past pollution reductions). Over the past five years under Whitman, New Jersey has developed a de facto trading market. EPA approval will not only sanction New Jersey's market but endorse the spread of similar pollution credit exchanges in other states.See: NEW POLLUTION TRADING FOR FOUR STATES GUTS CLEAN AIR ACT — Whitman Trading Plans Emerge as First EPA Policies Read the Request for an IG investigationand the NJ Overfile Request here. 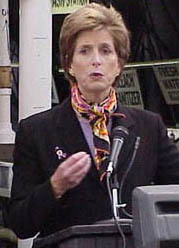 The Senate Environment and Public Works Committee held a confirmation hearing on Whitman on January 17, 2001. NJ based environmental groups, including Sierra Club adn Audubon Society, strongly opposed Whitman's confirmation, and submitted extensive documentation of her record. Those submissions and Whitman's detailed rebuttal were incporproated in the hearing record. A transcript of that hearing and the full record may be found here. "Whitman owns interests in oil wells in Texas and Colorado valued at between $55,000 and $175,000," reported the San Jose Mercury News on February 28, 2001 ("Top officials face conflict of interest queries over oil connections"). "She has promised to divest of them to meet ethics guidelines." The particular companies Whitman held investments in were CEX Operating Co. of Dallas, Hunt Oil Co. of Houston, and St. Mary Operating Co. in Colorado. The conflicts were highlighted during meetings of Vice-President Cheney's Energy Task Force. Whitman championed "free market environmentalism"; voluntary initiatives promoted by conservative think tanks and industry lobbies as an alternative to regulatory measures. Some of these programs included Climate Leaders, Energy Star, SmartWay Transport, and the new Water Quality Trading Policy and Bush's Clear Skies Initiative. Yet, "EPA documents showed that the number of officially defined smoggy days had increased by 32 percent from 2001 to 2002. The completion of clean-ups at Superfund sites was down by close to half," writes Laura Flanders in "Bushwomen." Eric Schaeffer, the EPA's head of regulatory enforcement under Whitman, resigned under protest. He told Flanders that Whitman is "a Republican first and an environmentalist way down the list." Court documents revealed that a multi-million-dollar verdict against the chemical company found liable (Monsanto) was changed in Monsanto's favor just days after Whitman received a forty-five-minute "briefing" on the case. On the eve of Whitman's departure from the EPA, a former EPA attorney who had testified in the Anniston case came forward and said that inspectors general at the EPA and the Department of Justice had pressured her not to testify. Janet MacGillibray, formerly a Superfund attorney, said a high-ranking EPA official told her Anniston didn't make a list of national clean-up priorities because Monsanto didn't want it to. In February 2006, a federal judge found Whitman guilty of making "'misleading statements of safety' about the air quality near the World Trade Center in the days after the Sept. 11 attack." The judge further found that Whitman "may have put the public in danger," according to the New York Times (Julia Preston, "Public Misled on Air Quality After 9/11 Attack, Judge Says," February 3, 2006). "The allegations in this case of Whitman's reassuring and misleading statements of safety after the Sept. 11, 2001 attacks are without question conscience-shocking," said Judge Deborah A. Batts. As early as September 13, 2001, the EPA put out press releases declaring "no significant levels" of asbestos dust, when agency officials knew there were significant hazardous emissions. Judge Batts' ruling allowed a 2004 class action lawsuit against Whitman and other EPA officials and the entire agency, which was filed on behalf of residents and schoolchildren from downtown Manhattan and Brooklyn, to go forward. Whitman's post-9/11 statements are further called into question by "the appearance of a conflict between Whitman's responsibility to the public and her own family's financial affairs," wrote Laura Flanders in her book "Bushwomen." "As the former Governor of New Jersey, Whitman owned bonds worth between $15,000 and $50,000 in the New York/New Jersey Port Authority -- the owner of the World Trade Center site and the major liable party in the affair. Her husband, John R. Whitman, formerly a Citigroup vice-president, manages hundreds of millions of dollars in the banking giant's assets, and Travelers Insurance, a Citigroup subsidiary, stood to lose multiple millions in Manhattan medical claims." Flanders gives the Whitmans' investment in Citigroup as being "up to $250,000 in stock," adding that "John Whitman received a six-figure bonus from Citigroup as recently as 2000." Whitman told The Record that "Being a former public official does give me the ability to raise the red flag for corporations as to the reaction of regulators to various proposed initiatives and some insight as to what to expect politically in the country." "We're going to have to recognize that there's a next generation of nuclear technology that is a whole lot safer than in the past." - June 14, 2004, Council on Foreign Relations briefing on "Climate change: What's next for American policy?" "New technology allows us to do it [produce nuclear power] better and in a safer way. The biggest hurdle obviously is where do you store the spent rods. There's also some research going on as to whether we are actually making maximum use of spent rods, if there isn't more we can get out of them that would render them even safer. We're working, obviously, closely with the Department of Energy on storage facility and what happens for a national facility." - interview with The Hill, published June 13, 2001 as "Interview: EPA Administrator Christine Todd Whitman"
"I don't think that you can say that more nuclear power is environmentally harmful, necessarily, from a clean-air standpoint. It's much cleaner than coal, and we're 51 percent coal dependent at the moment. The real discussion that we're going to have to have in this country, and it's going to have to be a nationwide discussion, is how much do we prize the ability to turn on the lights and have them turn on when we want them to, have heat in the winter and air conditioning in the summer versus no one wants gas pipelines near them because they might explode." - interview with Roll Call, published April 23, 2001 as "EPA Head Seeks 'Long-Term' Solutions on Pollution, Energy"
In Manchester, New Hampshire on October 12, 2007, giving a talk at the "Global Warming & Energy Solutions" conference organized by Clean Air-Cool Planet. ↑ Lisa Caruso, "Can We Talk (About Nuclear Energy? )," National Journal, September 9, 2006. ↑ Anton Caputo, "EPA ex-chief here pushing nuclear," San Antonio Express-News (Texas), July 9, 2009. ↑ 4.0 4.1 Press release, "Water Industry Leaders Launch Water Policy Institute to Address Current Challenges: Christine Todd Whitman to serve as chair; Hunton & Williams lawyer as director," Hunton & Williams, June 4, 2008. ↑ Rebecca Adams, "Water Policy: Whitman Dives In," Congressional Quarterly Weekly, July 6, 2008. ↑ Press release, "Cabinet Secretaries, Members of Congress, Scientists Create Roadmap to End Overfishing Crisis, Grow Fishing Economy," Environmental Defense Fund via PR Newswire, November 13, 2008. ↑ "Our team: Christine Todd Whitman," Whitman Strategy Group website, accessed April 2009. ↑ "Case studies: Developing a personal legacy," ASG Advisors website, accessed April 2009. ↑ "N.J. Dep Employees Say Whitman Administration Soft on Polluters — One in Four Report Orders to Ignore Violations," PEER.org, 1997. ↑ Jeremy W. Steele, "Q&A: Former EPA chief pushes for nuclear power", Lansing State Journal, September 19, 2007. ↑ Toni Johnson, Whitman interview: "Whitman: On U.S. Environmental and Energy Policy for the Future," Council on Foreign Relations, October 30, 2007. ↑ Amy Lane, "Forum debate: Do tax credits really help?" Crain's Detroit Business September 18, 2007. ↑ Sammy Fretwell, "Former EPA chief touts benefits of nuclear energy: Former EPA chief says South Carolina needs to depend less on coal, more on atomic power," The State (South Carolina), November 20, 2007. ↑ Daniel Terrill, "Former EPA Chief Touts Nuclear Power in Discussion at USC: Student Groups Say Investments in Nuclear Energy Take Away from Finding a Renewable Energy Source," The Free Times (Columbia, South Carolina), November 28, 2007. ↑ "Former N.J. governor to speak at Clemson," Independent Mail (Anderson, South Carolina), November 17, 2007. ↑ David Yepsen, "Yepsen: GOP moderates need champion," Des Moines Register (Iowa), November 18, 2007. ↑ "The Future of Nuclear," interview with Christine Todd Whitman on the WBEZ 91.5 fm Chicago Public Radio show "Eight Forty-Eight," February 12, 2008. ↑ David Funkhouser, "Yale Plans A Warming Summit: Schwarzenegger To Join Rell, Others To Urge U.S. Action On Problem," Hartford Courant (Connecicut), March 28, 2008. ↑ "Former EPA chief Whitman discusses nuclear energy," Associated Press, October 8, 2008. ↑ Tracy Idell Hamilton and Anton Caputo, "CPS to unveil nuke plant cost estimates," San Antonio Express-News (Texas), June 28, 2009. This page was last edited on 20 June 2017, at 20:38.